the nytpicker: Another Reason To Get The NYT Print Edition: Today's Harrowing Page-One Photograph From Drought-Ravaged Kenya. 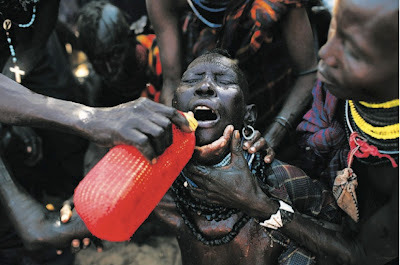 Another Reason To Get The NYT Print Edition: Today's Harrowing Page-One Photograph From Drought-Ravaged Kenya. The NYT ran an impossible-to-miss photograph from Kenya on page one this morning, by Jehad Nga, to illustrate a story on the effects of drought. The first reproduction is taken from the NYT website. The second is a screengrab from a PDF of the NYT's print-edition front page. The difference is clarity is clear. Either way, it's a disturbing and powerful image. I thought you guys were against waterboarding. Weird. NYT Home Page, 9/11/2001, 1:14 p.m.